Swiss Normandy is a place south of Caen where the Orne river dig its way along the hills. 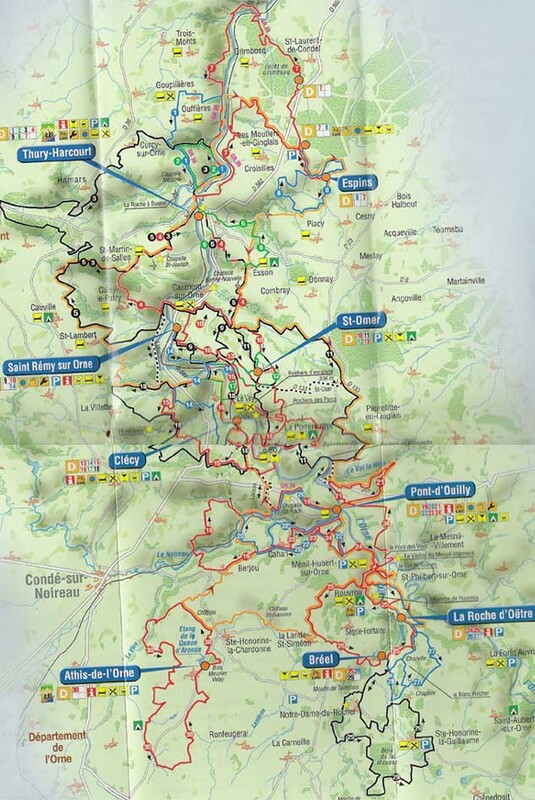 It presents a pleasant topography for the practice of the mountain biking and there are lot of nice trails in the area You can find 30 marked trails starting from 11 different cities (Breel, Thury Harcourt, Clécy, St Remy sur Orne, Pont d' Ouilly, Espins, St Omer, Athis sur Orne…), a large Swiss Normandy loop of 132 km, the whole forming 640 km of marked paths. From Thury-Harcourt, the departures of the circuits are done at the nautical base of Kayak. From Clécy, they also start at edge of the Orne, from Les Guiguettes. A guide with description and charts of each circuit is on sale for 5€ in all Tourist offices of Swiss Normandy. For more information, you can contact the tourist office in Thury Harcourt. Tel. :+33 (0)2 31 79 70 45. Thury Harcourt is located at about 30 km in the south of Caen by D562 road. It is possible to get to Swiss Normandy from Caen by MTB, while following the Orne river.